Madrid Durazno, G. V., & Castillo Zaragoza, E. D. (2017). Learners’ work in a SALC: A longitudinal study. Studies in Self-Access Learning Journal, 8(3), 203-222. Self-access centers (SACs) became popular in Mexico in the 1990s with the purpose of allowing learners to make decisions about how to learn languages. The following study is qualitative and longitudinal and was carried out in the SAC at the University of Sonora in Mexico. It was designed with the purpose of understanding learners’ performance as they direct their own learning in a SAC. By focusing on learning experiences, activities, and materials, the results show that learners understand the idea of language learning in SACs in a limited way. However, the participants view learning in a SAC to be an effective approach to learning languages due to the progress and growth they noticed. Self-access centers (SACs) provide learners with opportunities to experience language learning in a unique way. Such experiences are shaped by the learners’ decision-making in the SAC regarding the determination of objectives and the activities to be carried out, the selection of materials needed and the appropriate way to use them. With this in mind, having a better understanding of the learners’ practices in SACs is necessary to comprehend their language learning process. This project was designed to increase knowledge about SAC learners’ performance, investigating how they adapt to self-directed learning, the activities they carry out, and the materials they use. The article presents the learning experiences of five SAC learners, through the analysis of the aspects mentioned above. Self-access centers were first established with the idea of promoting learning autonomy in the language learning context; learner autonomy is a notion by which learners develop the capacity of controlling their own learning (Holec, 1981). Autonomous language learners make decisions regarding objectives and content, methodology and strategies, as well as monitoring and evaluation. According to Holec (2017), SACs are facilities where different resources and services are offered to learners in order to help them learn languages in a self-directed way. SACs are likely to contain a wide range of materials, and provide learning to learn workshops, advising programs, conversation groups, among other services. Based on Gardner and Miller (1999), SACs offer a learning environment in which every learner develops in a particular way. As they pointed out, language learning in SACs involves “an integration of a number of elements which combine to provide a learning environment. Each learner interacts with the environment in a unique way” (Gardner & Miller, 1999, p. 8). According to Gardner and Miller (1999), elements of a SAC create a learning environment that increases the possibilities for learning opportunities. As self-directed language learning is promoted in SACs, learning experiences may develop once learners begin to freely interact in such spaces through the carrying out of different activities and the use of the materials and resources offered to them (Domínguez, 2012). In this sense, learners explore new learning experiences (Croker & Ashurova, 2012) by which they become more involved in their learning process and start to adapt to a different way of learning (Herrera, 2012). In order to provide learners with a more effective way to work in a SAC, the center may offer the help of advisors. They will help learners to reflect on their own learning and develop their capacity to learn (Gremmo, 1995; Mozzon-McPherson, 2001, 2007; Victori, 2007). In this sense, the role of advisors is extremely important in a SAC (Gremmo & Riley, 1995). Based on the previous information in this project, the learning experience in a SAC refers to that unique way in which every learner interacts with the environment to make decisions regarding their learning. In Mexico, the development of SACs began in 1994 with the implementation of the North American Free Trade Agreement (NAFTA) causing an exponential increase in the demand for foreign languages (FL); however, there were not enough facilities and teachers prepared to address the situation. Under these conditions, the government, via its Mexican Ministry of Education, started to take measures. One of these was the training of FL teachers, particularly in English, which, at the time resulted in a large number of BA English Language Teaching programs that are now offered all over the country (Castillo Zaragoza, 2006). The second measure was the introduction of SACs for language learning in every state university of the country, which meant that 32 SACs were established in order to start providing Foreign Language Learning services. In tripartite agreements, the ministry initiated the following: 1) funding was provided in order to set up the SACs, 2) teachers were trained, and 3) state universities provided the facilities. As a result, there are currently over 250 self-access centers across the country, suggesting that SACs are an important element of the Mexican university context. Research in Mexico regarding language learning in SACs has covered different aspects, such as ideologies about the setting up of SACs (Castillo Zaragoza, 2006); the advisor’s role and training (Clemente, 2003; Contijoch Escontria, 2000; Fabela Cárdenas, 2012); the characteristics of learners who visit SACs (Bufi Zanón & Chávez Sánchez, 2000); material development in the SAC (Groult Bois, 2000); plurilingualism by the advisor (Castillo & Gremmo, 2003; Gremmo & Castillo, 2006) and the learner (Castillo Zaragoza, 2011; Castillo Zaragoza & Pamplón Irigoyen, 2013); and learning experiences in SACs (Castillo Zaragoza, 2011, 2014; Domínguez Gaona, 2013; Herrera, 2012). As rich and varied as research in Mexico has been, there is a need to continue researching learners’ decisions regarding their learning and actual performance in a SAC. 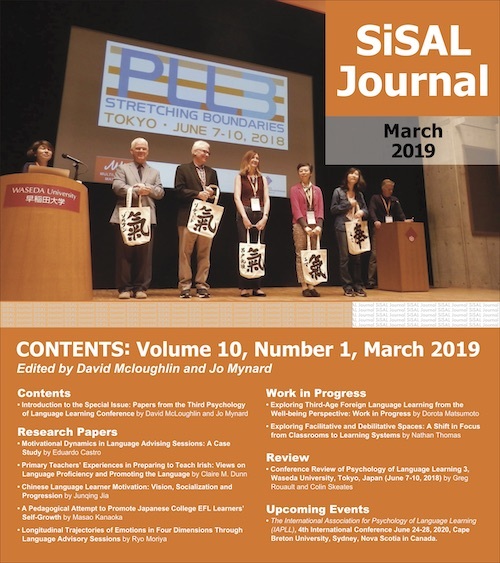 Recent studies related to language learning in SACs have been developed in the Asian, American and European continents in countries such as Japan, Mexico, France, Germany and Turkey. For the most part, these studies are framed on a qualitative approach and have employed data collection instruments that include semi-structured interviews, questionnaires or surveys, observations, and analysis of documents such as portfolios, diaries or attendance registers. Learning experiences in SACs (Castillo Zaragoza, 2011, 2014; Domínguez Gaona, 2013; Herrera, 2012). It is worth mentioning that the studies in the latter category were all developed in Mexico and are closely related to the purpose of the present study. They served as a reference because they paid attention to the individual and their lived experiences in the SAC, providing a deeper view of the SAC learner and the learning taking place. Nonetheless, as mentioned before, more investigation is needed regarding the actual work people do when they are in the SAC on their own. Therefore, the present research attempts to close the gap and to help build a better understanding of the learners’ development in SACs. The study was developed at the Centro de Autoaprendizaje de Lenguas Extranjeras (CAALE), a SAC located in the Foreign Languages Department (FLD) at the University of Sonora in northern Mexico, where different language courses are offered to the local and university community. The SAC is available for the people registered in one of the mentioned courses, as well as to people not taking any language classes. According to the FLD’s website (Foreign Languages Department, 2014), CAALE is a place where people can learn and practice languages, it has a variety of materials and resources accessible for its users, and overall, it represents an alternative for those who have a difficulty attending classes on a regular basis, want to work at their own pace, or wish to prepare for an official test. The resources and materials included at CAALE support learners of Arabic, Chinese, English, French, German, Italian, Japanese, Portuguese, Russian and Spanish. Additionally, CAALE offers advising sessions to guide users in the development of a working plan, learning strategies, available materials, and the different ways to use them. The purpose of this project was to obtain data that would lead to a better understanding of the SAC users and the work they carry out. This information was based on the analysis of the activities learners carried out, the materials and resources they selected and how they used them. In other words, the objective was to obtain knowledge about the users’ language learning experience in CAALE as they adapted to the environment and a self-directed learning process. How do the participants learn in the SAC? What materials and resources do the participants select, why do they choose them, how do they work with them and why? How do they adapt to the SAC environment? Considering that qualitative research is preferred for describing and interpreting a phenomenon, as well as the meaning of it to those involved within its natural context (Cresswell, 2007; Denzin & Lincoln, 2005; Glesne, 2011), this study was designed as qualitative and longitudinal. Therefore, it was done within the learners’ environment. Data collection methods included two interviews, observations, and the analysis of learning diaries. Finally, it was conducted over a two-semester period, which allowed the researcher to familiarize with the SAC’s functioning (during the first semester of the study) and to give the opportunity to the learners to develop and interact in the SAC environment (during the second semester of the study) . The project is characterized by the development of a case study that focused on the description and interpretation of the activities carried out in the SAC by five participants. The decision was made because case studies enable the exploration of an individual’s meaning to a particular situation (Yin, 2003). Each case study described the learners’ perspective about their own particular learning process in CAALE. The researcher carried out random observations during a two-semester period. During the first one, observations were focused on obtaining detailed information about the SAC environment. And in the second one, the focus was on the participants’ activities and their learning decisions in the center, taking into account the material selection and the way they use them. In order to document the information collected, notes were taken during every observation carried out. Two semi-structured interviews were conducted by the researcher with each of the participants, one at the beginning of the second semester and the other one at the end. The aim was to gather information regarding participants’ motives, goals, feelings, and decisions about the experience of learning languages in the SAC. Participants were asked to keep a learning diary in which they wrote their own reflections regarding the languages they worked on, the activities, the materials, and the challenges faced, among other things. In order to do so, learners were given a notebook and a series of questions in Spanish that served as a guideline (see Figure 1); nonetheless, they were invited to openly write about any reflection, feeling, or comment they wished to express. The objective was to have more information about their decision-making and to have a deeper understanding of their learning experience. The selection criterion was open and inclusive, considering men and women willingly attending the SAC, from different age groups and backgrounds. Also, it was not a requirement to be registered in any language course or to be learning one specific language, or more than one. With this in mind, five SAC learners, three women and two men, were asked by the researcher to be part of the study and voluntarily agreed to participate. The selection was made considering the regularity of their visits to CAALE. Their ages ranged between 20 and 30 years and had different professional and academic backgrounds (See Table 1). They were asked to regularly attend CAALE without a set schedule, participate in two interviews, and keep a learning diary of every visit to the center for a one-semester period. Participants accepted to be involved in the project without any sort of payment. The following results were obtained based on the information gathered by 27 random observations, the two semi-structured interviews, and the analysis of the learning diaries written by each participant of the project. The analysis was done with a matrix developed on the data collected (Miles & Huberman, 1994) and later interpreted by the researcher. The results presented focus on the participants and the similarities and differences among them. The information regarding the participants and their work in CAALE is briefly presented in Table 2. As previously mentioned, in this project, the learning experience in a SAC refers to the unique and particular interaction between the learners and the center. This is shaped by the learners’ decisions regarding their learning within the environment. The outcomes of this experience can be seen in their increased language performance and their personal growth. The information obtained in the interviews, especially the second one conducted at the end of the project, suggested that for the participants, learning languages in CAALE was effective. Despite the feeling that it is necessary to continue working towards reaching their objectives, all participants felt they progressed in their language learning. Vanessa, Marco and Leonel were able to identify situations in which they confirmed the work done in the SAC was effective. For instance, as they commented in the interviews, they obtained better grades in their classes, understood articles related to their area of studies more easily and stopped using a translator to understand movie scenes (See Table 3 for examples of increased language performance). For such reasons, they pointed out their interest in continuing studying languages in the SAC in addition to their language courses, since they considered it a helpful tool for their classes. The opinion of all the participants about CAALE was positive. When asked about ways to improve CAALE, they suggested increasing the authentic material options such as movies and books. Lastly, they suggested promoting the center to the rest of the university and the local community as they thought it was a helpful and effective tool to learn languages. working with songs, translating articles or song lyrics, answering grammatical exercises in textbooks and websites, vocabulary searching in dictionaries and online translators, as well as playing board games with other users. According to Carla and Leonel, the conversation clubs were of great help because they allowed them to improved their speaking and listening abilities. Besides, their confidence when using the language was boosted as they felt secure while they expressed themselves during the sessions. In contrast, for Marco, who concentrated on his reading comprehension in English, it was common for him to work with textbooks and magazines containing exercises. Based on the participants’ comments, working on these activities contributed to improved performance in their language courses resulting in better grades. Similarly, they enhanced their comprehension of spoken and written language since learners reduced the use of translation methods as they continued carrying out these tasks. The materials were selected depending on the type of activity carried out. Participants used written and digital resources to accomplish their objectives such as the textbook used in their languages classes, books and magazines designed for the reading comprehension development, and finally, websites dedicated to the teaching and learning of languages. When using authentic materials, they tended to work with audiovisual and written ones such as different genre movies and series, recent magazines and newspapers, in addition to novels and short stories. Participants also used the available resources in the SAC, for instance, the television and DVD players, worktables, reading spaces and the cubicles where the conversation clubs take place. The selection of materials and resources implied an understanding of their purpose and use, as they were used appropriately. Nonetheless, it was constrained primarily to textbooks, movies, and reading materials, which suggests little knowledge of the possibilities offered in the SAC, as well as the different ways to use them to achieve a variety of objectives. Finally, it is relevant to mention that the participants did not request guidance of an advisor at any moment. It is considered that this lack of advising during the project played an important role in the learners’ development and limited usage of the materials. This research aimed at providing answers regarding the way SACs learners work when they are in such centers and the way they start to direct their learning process, considering their interaction with the SAC elements, specifically, the activities carried out and the materials and resources used. The results obtained from the study suggest that participants have a reasonable understanding of how to develop in the SAC environment, as they actively decided on the tasks to be done and the materials to be used. However, as identified in the learning diary entries and their comments in the interviews regarding advising, they did not make use of such services. In this sense, they worked on a ‘no-help’ view that limited the variety of activities done and the materials or resources used, since they commonly performed the same activities and did not diversify much. In their study, Domínguez-Gaona, López-Bonilla and Englander (2012) found a similar behavior in learners, in the sense that they did not seek out advising either, based on the idea that working autonomously meant developing without the help of others. Participants also explained that the work done in the center helped them progress in their language learning since they got better grades in their language classes and understood spoken and written texts more easily. Language learning in SACs is considered, as expressed by Vanessa, Marco, Leonel and Diana, an effective tool to take advantage from while taking formal language classes. In her study Herrera (2012) concludes that students partially accept self-access language learning because they still prefer to attend classes. This may suggest that there is a lack of learner formation in what the language learning in SACs implies, as well as, in learning to learn. In regards to the adaptation process to the SAC environment and the self-direction of their learning, as noted in the learners’ comments in the interviews, the beginning of the experience was difficult. Their perspective changed as soon as they grasped the purpose of a SAC and felt connected to the rest of the users. This project was designed to describe, through five case studies, how learners in SACs work and their learning experience, considering how they adjust to the working mode, the activities done and the materials employed. The information obtained is based on a two-semester period, one of observations in the SAC about its functioning and another one following the performance of five participants learning different languages at the SAC of the University of Sonora. The results suggest that there seems to be an adaptation process by which the learner understands the working mode and starts making decisions regarding his or her own learning. However, more research about the transition from a formal class mode to SAC language learning is needed, with respect to the factors that influence the adjustment and the effects on the learners’ performance. As learners tend to behave in a similar way on every visit to the center and their use of the services, materials, and resources available is limited, it would be relevant to carry out research about the actual learner training in SACs and how it affects their development in the centers. Nonetheless, the outcomes of this study should not be generalized due to its particular design. Victoria Madrid is a Masters in Humanities student in the area of Foreign Language Teaching in the Universidad de Sonora. She also holds a BA in English Language Teaching from the same institution. Her research interests include learning autonomy, self-directed learning, and language learning in self-access centers. Desirée Castillo Zaragoza is an Associate Professor at the Foreign Language Department of the Universidad de Sonora, Mexico. She received her PhD in Language Sciences at the Université de Lorraine, France. Her main research interests and publications are related to self-access centers, self-directed learning and multilingualism of learners working in Mexico. Benson, P. (2011). Teaching and researching autonomy in language learning (2nd ed.). London, UK: Pearson Education. Castillo, D., & Gremmo, M. (2003). Autodirection, plurilinguisme, interdisciplinarité: conseiller dans un centre de ressources multilingue [self-direction, plurilingualism, interdisciplinarity: Counselors in a multilingual resource center]. In S. Carton & P. Riley (Eds. ), Le Français dans le Monde: Vers une compétence plurilingue [French in the World: Towards a plurilingual competence] (pp. 178-192). Recherches et applications, juillet. Paris, France: CLE International. Castillo Zaragoza, E. D. (2006). Centres de ressources pour l’apprentissage de langues au Mexique: Représentations et pratiques déclarées de conseillers et d’apprenants [Language Learning Resource Centers in Mexico: Representations and Declared Practices of Counselors and Learners]. Unpublished PhD Thesis. Université Nancy 2, France. Castillo Zaragoza, E. D. (2011). Identity, motivation and plurilingualism in self-access centers. In G. Murray, X. Gao & T. Lamb (Eds. ), Identity, motivation and autonomy in language learning (pp. 91-106). Bristol, UK: Multilingual Matters. Castillo Zaragoza, E. D. (2014). Autonomy: Four case studies in a Mexican SAC. In G. Murray (Ed.) Social dimensions of learner autonomy (pp. 192-210). Basingstoke, UK: Palgrave MacMillan. Castillo Zaragoza, E. D., & Pamplón Irigoyen, E. N. (2013). Mexican plurilingual learners’ representations about language and language learning. In E. Ruíz-Esparza Barajas & E. D. Castillo Zaragoza (Eds. ), Beliefs about language teaching and learning. Different contexts and perspectives (pp. 89-112). Naucalpan, Mexico: Pearson. Clemente, M. (2003). Learning cultures and counselling: Teacher/learner interaction within a self-directed scheme. In D. Palfreyman & R. Smith (Eds. ), Learner autonomy across cultures (pp. 201-219). London, UK: Palgrave Macmillan. Contijoch Escontria, M. (2000). Formación de asesores de la mediateca del CELE: Reporte del diseño de un seminario de preparación para profesores interesados en trabajar en una mediateca [Formation of advisers of the CELE mediateca: Report on the design of a training seminar for teachers interested in working in a mediateca. Estudios de Lingüística Aplicada, 30/31, 145-158. Cresswell, J. W. (2007). Qualitative inquiry and research design: Choosing among five approaches (2nd ed.). Thousand Oaks, CA: Sage. Denzin, N. K., & Lincoln, Y. S. (2005). The Sage handbook of qualitative research (3rd ed.). Thousand Oaks, CA: Sage. Domínguez Gaona, M. R. (2013). El centro de autoacceso de la facultad de idiomas Tijuana: Sus recurso y eventos de literacidad [The self-access centre of the Tijuana Faculty of Languages: Its resources and literacy events]. Unpublished PhD Thesis. Universidad Autónoma de Baja California. Ensenada, Mexico. Glesne, C. (2011). Becoming qualitative researchers: An introduction (4th ed.). Boston, MA: Pearson. Gremmo, M-J. (1995). Conseiller n’est pas enseigner: Le role du conseiller dans l’entretien de conseil [Advising is not teaching: The role of the advisor in an advising session]. Mélanges Pédagogiques, 22, 33-61. Gremmo, M., & Castillo, D (2006). Advising in a multilingual setting: New perspectives for the role of the advisor. In T. Lamb & H. Reinders (Eds.) Supporting independent language learning: Issues and options (pp. 21-35) Bern, Switzerland: Peter Lang. Groult Bois, N. (2000). Elaboración de materiales para el desarrollo y seguimiento del proceso metacognoscitivo en aprendizaje autodirigido [Elaboration of materials for the development and monitoring of the metacognitive process in self-directed learning]. Estudios de Lingüística Aplicada, 30/31, 307-311. Herrera, L. (2012) Self-access language learning: Students’ perceptions of and experiences within this new mode of learning. Profile, 14, 113-127. Holec, H. (1996). Self-directed learning: An alternative form of training. In H. Holec, D. Little & R. Richterich (Eds. ), Strategies in language learning and use (pp. 77-132). Strasbourg, France: Conseil de l’Europe. Holec, H. (2017). Mission au Mexique. [Mission to Mexico] In E. D. Castillo Zaragoza & R. Domínguez Gaona (Eds.) 20 años después: La historia de los centros de autoacceso en México [20 years later: The history of self-access centers in Mexico]. Mexico City, Mexico, Pearson. Mozzon-McPherson M. (2001). Language advising: Towards a new discursive world. In M. Mozzon-McPherson & R. Vismans (Eds. ), Beyond language teaching towards language advising (pp. 7–22). London, UK: CILT. Mynard, J., & Carson, L. (Eds.) (2012). Advising in language learning: Dialogue, tools and context. Harlow, UK: Longman. Saldaña, J. (2003). Longitudinal qualitative research: Analyzing change through time. New York, NY: Altamira Press. This study was designed from a larger project developed by the second author of this article. For the first author, the experience in SACs began with the initial phase of the research. For this reason, the first stage was dedicated to the familiarization with the center and its functioning. In the second stage of the project, besides researching, she also worked as an advisor, which allowed her to follow the participants’ work in the SAC.